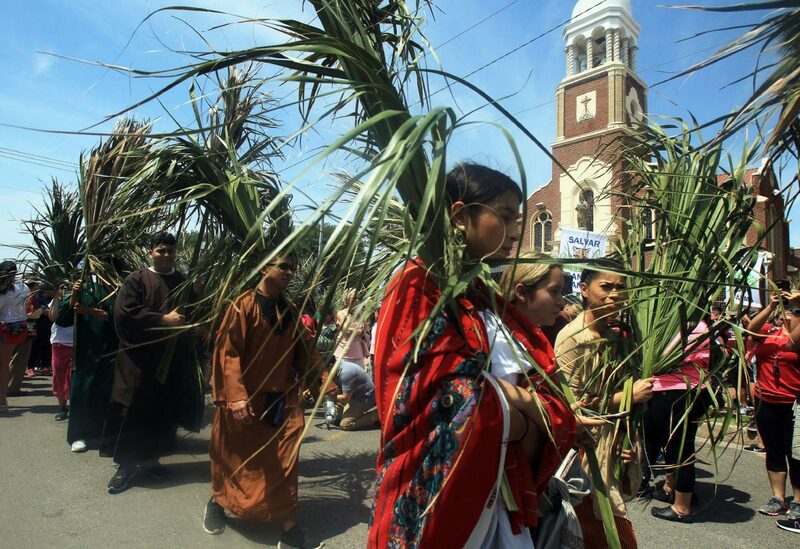 Congregates of Our Lady of Guadalupe church make their way to the historic La Lomita shrine to commemorate Palm Sunday. MISSION — In what may be the last time they do so, more than 1,000 congregates of Our Lady of Guadalupe church made their way to the historic La Lomita shrine. Outside the Mission church, just after the Palm Sunday Mass was celebrated at around 2 p.m. Father Roy Snipes declared it time for attendees to make their “pilgrimage to Jerusalem,” and like a “herd of turtles,” they headed toward the La Lomita Chapel, the mother church to Our Lady of Guadalupe, which is only yards from the Rio Grande. Palm Sunday is celebrated the final week of Lent and commemorates Jesus’ return to Jerusalem days before he was crucified. Attendees of the Mass and the subsequent procession suffered through more than 90-degree weather as they made a straight path down Conway Avenue toward the river where the chapel stands a mere 100 feet from. The scene was reminiscent of the protest last August when hundreds of protesters gathered to voice their concerns about a levee wall cutting off the historic shrine from the public – leaving it between the river and Mexico. Earlier in the week, lawmakers approved funding for 25 miles of border fence in Hidalgo County as part of the Trump administration’s push for a physical wall on the U.S.-Mexico border. Now it appears that the next time the congregation makes the four-mile trek to the La Lomita Chapel, a more than 150-year-old landmark that predates the city, it will be behind a fence. Guadalupe Cortez, a nun at Our Lady of Guadalupe, sat just outside the church and played her guitar moments before the procession began. She said she’s participated in the procession for well more than 15 years. Like many people in attendance — Cortez said she heard the news about the wall. “We’ve heard a lot about the wall lately and they say it’s going to wall off La Lomita,” she said in Spanish. Betty Pérez, 66, who resides north of La Joya and has been an active member of the Sierra Club for more than 10 years, said despite the exclusion of Santa Ana National Wildlife refuge from border wall construction, at least for now, the news of more border wall funding was a tough pill to swallow. Rachael Freyman-Brown, a fellow Sierra Club member, joined the procession with about more than a dozen anti-border wall protestors. Freyman-Brown said despite what appears to be a small victory for Santa Ana, other places in the county are now in danger of being fenced off from the public. “We have to keep having faith and moving forward, and realizing the struggle is never really over, and all the different groups who oppose the wall are very united,” she said. The 51-year-old Weslaco resident said she has been protesting the wall for more than 10 years.